Tell everyone on this train, I love them. I’ve never been more deeply moved by eight words. I’ve never heard more beautiful words ever spoken. When I first read about these words, I couldn’t get them out of my head. They rang even louder, when I happened to glance at the arraignment of Jeremy Christian and saw and heard him speak. Although I live in Bend, I was in Portland last Friday night. I first learned about the attack the following morning, sitting in a coffee shop downtown. It hit pretty close to home. I first read about from a friend’s Facebook post. “My friend’s son was killed in a terrorist attack in Portland,” it said. “Let me say that again,” she wrote. 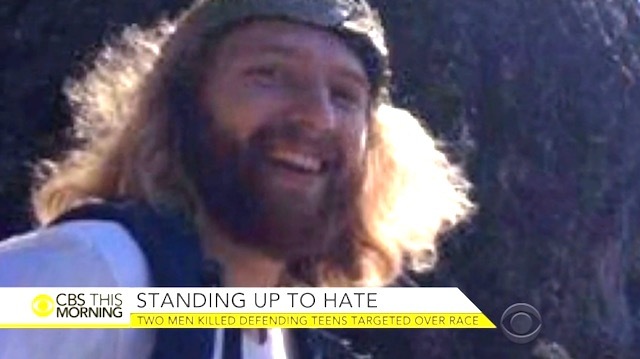 “My friend’s son was killed in a terrorist attack in Portland.” As I sat there drinking my coffee, I was completely shaken by what had happened. It occurred to me, as I saw a variety of people of different looks, dress, ethnicities come and go, that this attack could have easily happened right there, at any time. On Friday night, I had attended an open mic in Hillsboro at Influence Music Hall, where there were also people of different ethnicities, backgrounds, and ages. This could have happened there as well. Last night, I discovered that Rachel grew up with a friend who is part of the spiritual community I belong to here in Central Oregon, someone I play music with every Sunday. And not only that, but she is also related to another friend I know from the spiritual community I belonged to in Atlanta, where I lived for 20 years. This is not a coincidence. It’s a perfect example of how we are all connected. We are all in this together. We are all passengers on this train called life. After much meditation and deep thought on Taliesin’s words and on the events of that night, I wrote the song “On This Train.” Music is the language of love. My hope is that if the world hears this song, they will think of Taliesin’s message and take it to heart. The loss of their lives breaks my heart. But they are very much alive through their love and spirit that lives on. The outpouring of love from the Portland community—and around the world—is incredibly heartwarming and shows that we can accomplish amazing things when we embrace love. Muslim, Christian, black, white, gay, straight—we are all on this train together. Even now, I am still deeply moved by this stand for love. I can not be silent. Too often we are silent, and we don’t tell people those words that are so simple, yet so hard to say sometimes. I love you. I love everyone on this train we’re on. 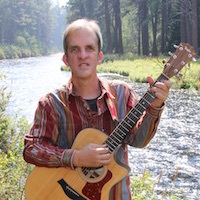 Victor Johnson is a singer/songwriter based in Bend, Oregon. He recently released his fourth CD, Beautiful Things, recorded at Soundsmith Studios in Bend, which he co-produced with Clay Smith. Johnson has an eclectic style, characterized by unusual chords (colors and textures), subtle changes between major and minor, strong, engaging vocals, and gorgeous, inspired lyrics, full of nature imagery. Major influences include Joni Mitchell, Rush, Grateful Dead, Nick Drake, Stevie Wonder, and John Coltrane. Johnson finds inspiration, spending time amongst the forests, lake, mountains, waterfalls, and rivers of Central Oregon. He seeks to celebrate the divine beauty in all people, places, and things through music and empathy. You can connect with him on his website here. He is also a member of the Charter for Compassion, an organization seeking to change the world through empathy.